This is a really good tasty ‘store cupboard’ lunch. 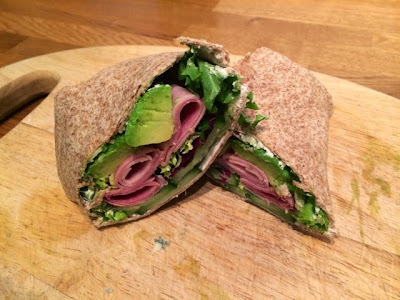 It just goes to show if you’re going to start making wraps you don’t really need to go and buy loads of fancy things you wouldn’t normally buy to have as fillings, you’ve got plenty of tasty stuff in your fridge already. Okay, so I may not be totally normal in that there’s usually an avocado knocking about it my kitchen, but most people usually have ham and cheese and a bag of salad in the fridge right? You can even use leftover nobbly bits of cheese that need using up, you know the awkward sized lumps that don’t really slice up nicely for sandwiches or are a bit too small to put on a cheese board? 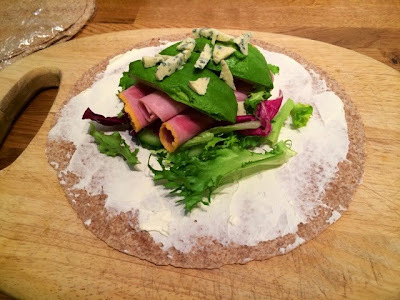 I had an awkward nobbly bit of blue cheese to use up so it’s a chunk of that that I used in this wrap but use up whatever you have in the fridge.